Supreme 7000™ Synthetic Plus Racing Oil is a high zinc, multi-grade, para-synthetic engine oil designed for gasoline racing engines including those that contain flat tappet cams and those that are turbocharged or supercharged. 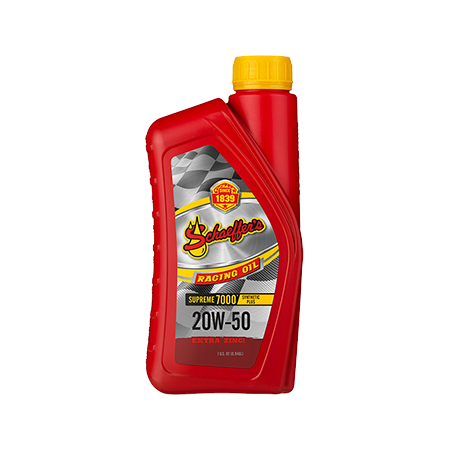 Supreme 7000™ Synthetic Plus Racing Oil is engineered with severely hydrofinished polyalphaolefin (PAO) synthetic base oils, severely raffinate hydro-converted Group II Plus, a proprietary additive package, and a viscosity index improver. Using proprietary friction modifiers, Micron Moly® and Penetro®, our racing oil creates a slippery, tenacious shield to prevent metal-to-metal contact. As conditions intensify, this high performance racing oil resists thinning, and shields critical engine parts from heat and wear. By reducing friction and wear, Supreme 7000 Synthetic Plus Racing Oil increases engine efficiency and extends engine life. With its high detergency and dispercency, our racing oil suppresses the formation of deposits, sludge and varnish and provides exceptional keep-clean performance. Supreme 7000™ Synthetic Plus Racing Oil is not recommended for 4-cycle, ATV or motorcycle engines specifying a JASO MA or MB, NMMA FC or FC-W 4-cycle oils. Extra protection for when engines are operating at higher temperatures. Rapid circulation and excellent pumpability. Extra zinc to protect flat tappet cam engines and other components from wear. Excellent high temperature, high shear performance. Reduced oil ageing for increased drain intervals.